After a rocky marriage and even rockier divorce, Sheriff Flint Cahill finally has something good in his life again. Maggie Thompson's down-to-earth charm and beautiful smile hooked him from the start. When she disappears on the day they plan to start their lives together, all signs point to abduction—and his ex-wife. 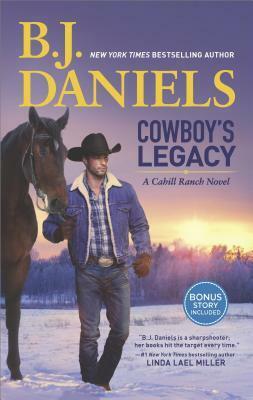 Cowboy's Legacy presents a tangled web of suspense that B.J. Daniels unravels with flair and expertise. Flint Cahill and Maggie Thompson have been dating for a while, but things seem to be getting serious. Maggie decides it's time to move in with Flint, but the day she begins moving her things she disappears. All suspicion is placed on Flint's jealous ex-wife who has been nothing but trouble. When her alibi checks out the search continues in a new direction. Flint calls in a PI couple to investigate the background of a woman who went missing from the area recently. Somehow there's a connection between the two disappearances, and Flint will do everything in his power to find it before Maggie is taken away from him forever. This story was way more involved than I expected it to be. I thought it would be heavy on the romance and light on suspense, but my, oh my was I surprised! About 80% of the story involves the race against time to find Maggie and Jenna, and the rest is getting to know the characters better. Flint is the sheriff of the town and his character dominates the pages. He's a hero in every respect, and the kind of character you know deserves love because he spends most of his time caring for others, like his brothers and sister. Maggie has an interesting history, but her personality was bland and forgettable, even overshadowed by Flint's dramatic ex-wife. Only the events happening around her made her a distinct character, otherwise she seemed more like a one dimensional, secondary character. The winter setting doesn't take away from the cheer that spills throughout the story. Even through a dire situation Flint and his family and friends rally together and look forward to whatever good things come their way. Overall, Cowboy's Legacy is a superb romantic suspense novel that will appeal to readers of Delores Fossen!